This is the official start of the project! 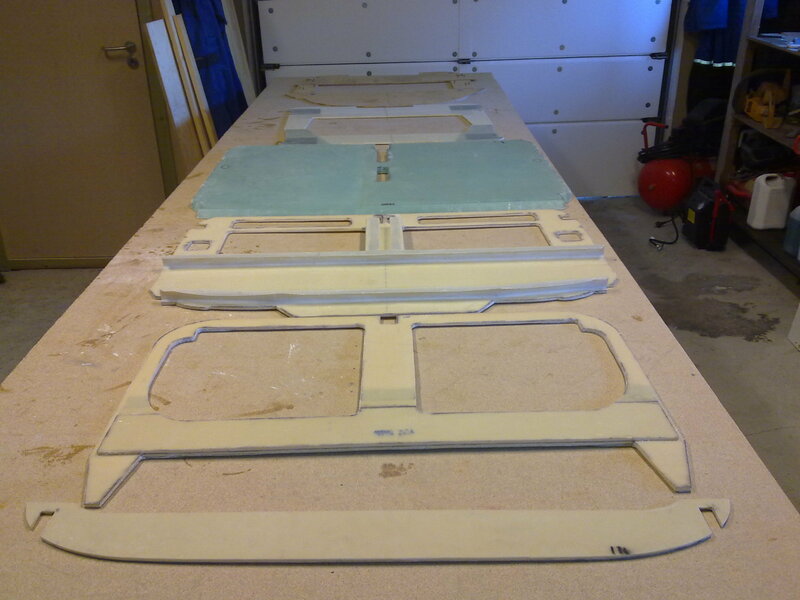 I will make my first real parts, all the bulkheads, the front seatback and the firewall. It starts easy to give me some experience before things get more tricky. Not much to explain here, I will only post some pictures here. 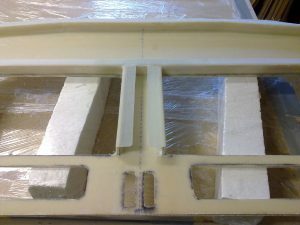 The front side is glassed with two plies of BID on the front side, and one ply on the backside. A lot more work here. Combinations of BID and UNI makes these parts a bit more complicated. It’s important to take your time and read the instructions before you start up. 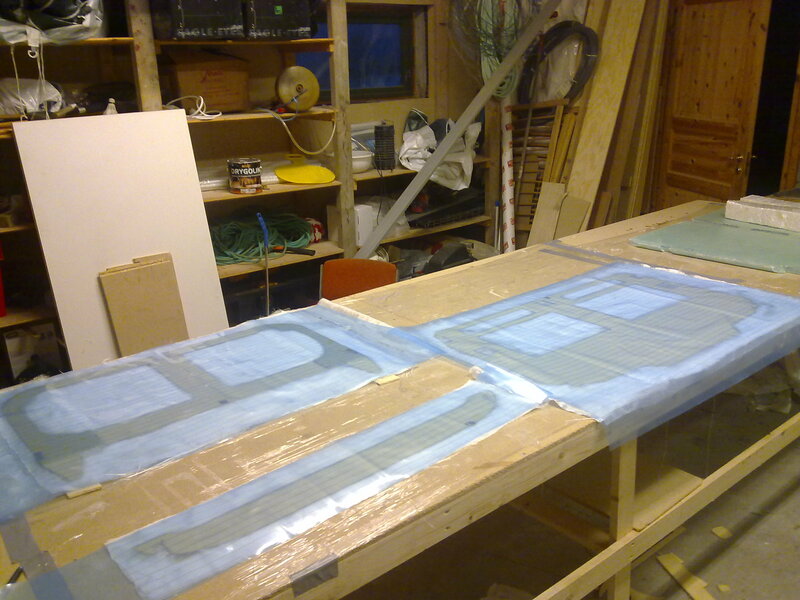 I decided to cut all the glass for the side I was going to work with, and place them in sequence. 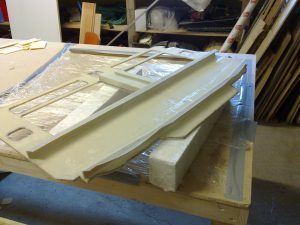 That includes the peel-ply as well. 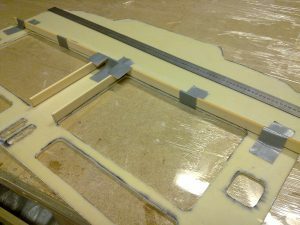 Here are the parts glassed, with peel-ply and a plastic-cover on top as a release-agent since I am going to weight down the parts. 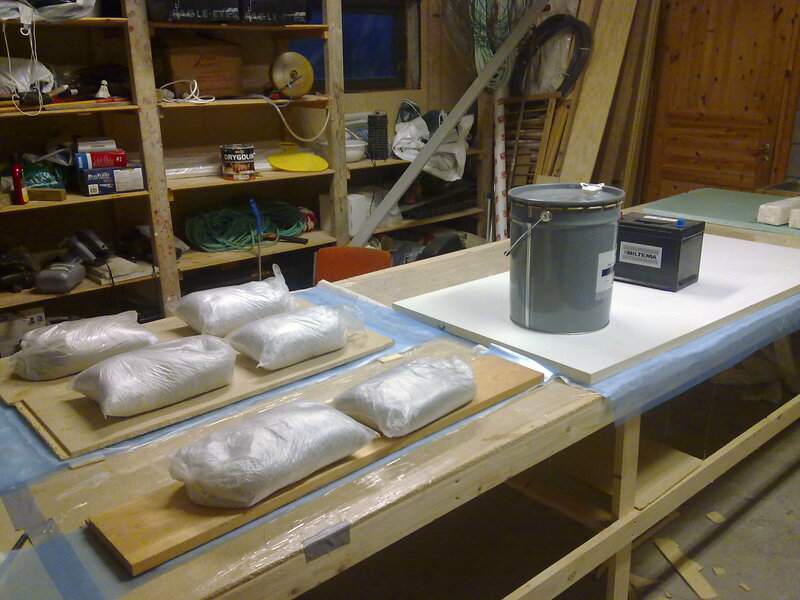 The parts all weighted down using sand-bags and some other heavy stuff. 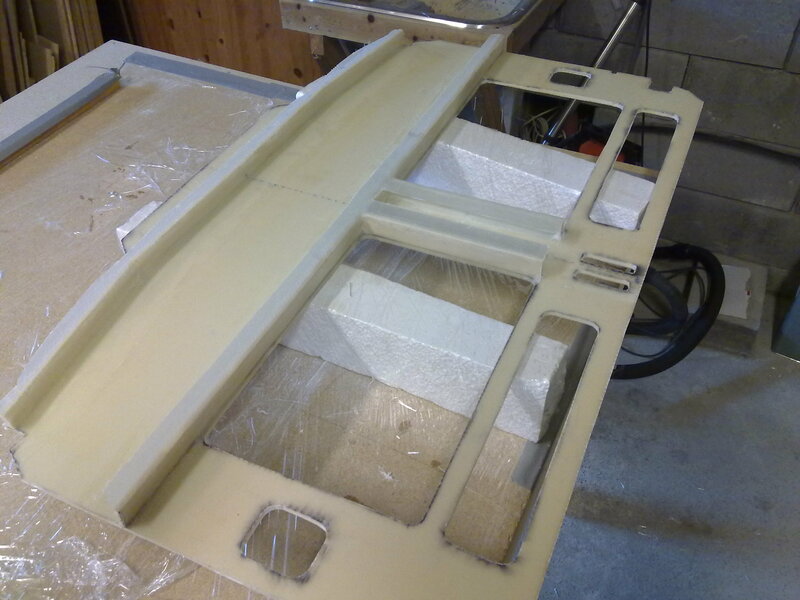 The instrument panel – IP for short and used hereafter – has some stiffeners attached on the front side. The drawings and pictures in the instructions are not very good at this point so I had to look through several builder-pages before I understood what I was going to do here. 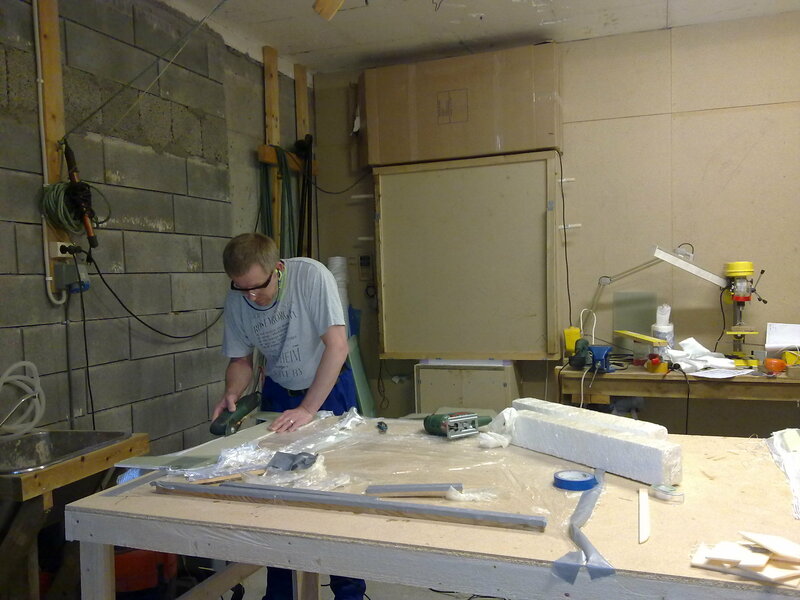 These ribs has two purposes: To stiffen the IP and act as cable-guides later on. 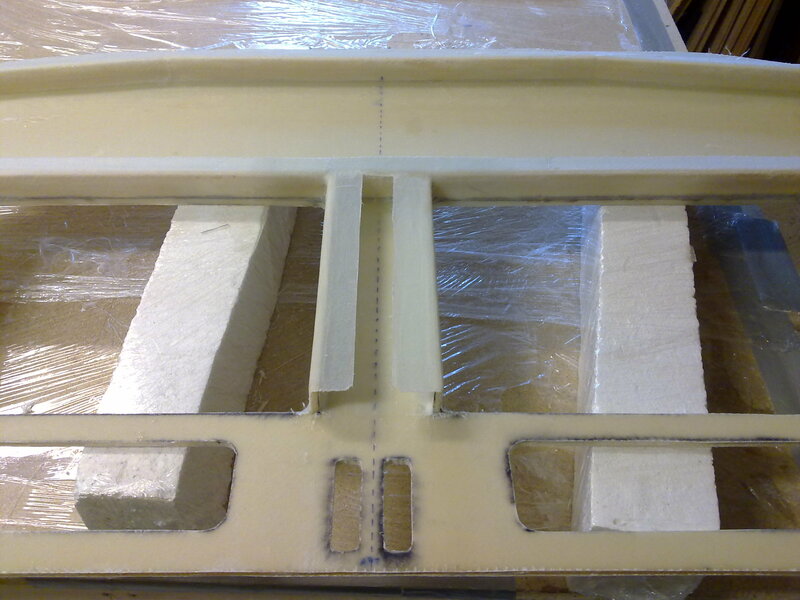 They are made of the same foam as the IP, 1″ wide/tall whatever… The first picture here shows the lower horizontal rib and the two vertical ribs. There is also an upper rib as you will se in the pictures further down. 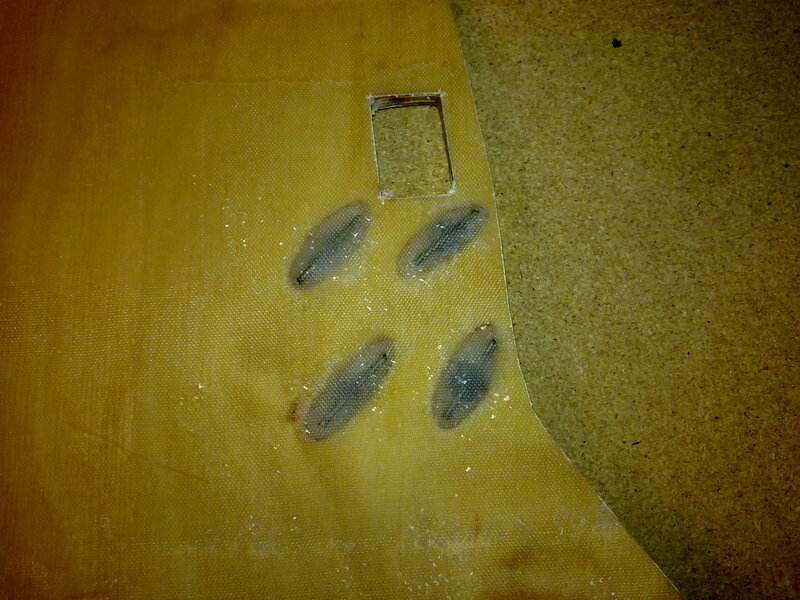 The ribs are simply glued to the IP using 5-minute epoxy. 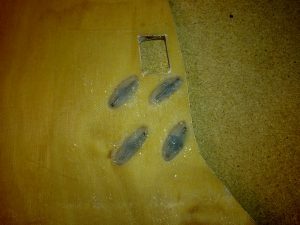 Remember to rub the IP with sandpaper prior to fastening the rib, to ensure proper surface for the glass that are to be epoxied later on. The ribs are then covered on one side first with one ply of BID then set to dry. The corners are to be filled with dry micro to make a find rounded corner for the glass to follow. You see this in the next picture – the white line between the IP and the vertical rib. After cure and trimming the fun part begins. 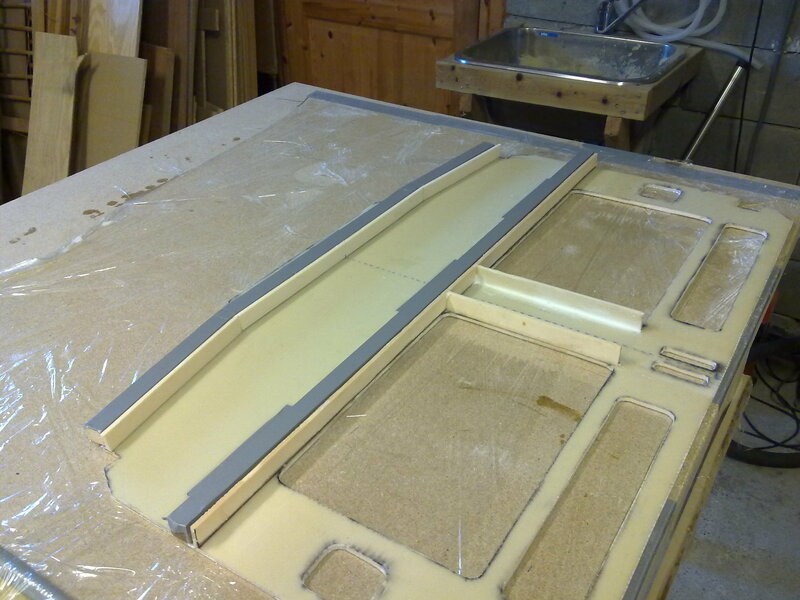 Now we are to make a cabel-channel out of the ribs! It took me some time to understand this, but again – thanks to all the builder-pages I figured this out. 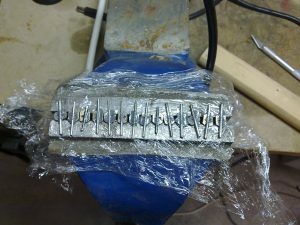 The channel is made of two plies of BID wrapped over the rib and onto a temporary support I made of some 1″ thick wood I cut on my saw. I covered the wood with duct-tape to avoid the glass to fasten to the wood. Then I glassed the other side of the rib, bending the glass over the temporary supports I made. 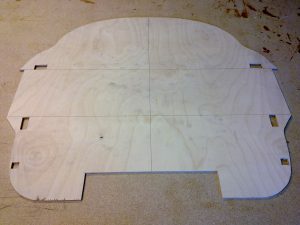 I covered it all with peel-ply and set to dry. After cure I carefully removed the wood-supports and trimmed the channels. Turned out to be rather good I think. Not much to say other than “follow the plans”. 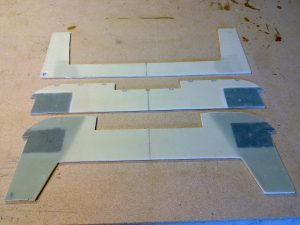 I did one mistake resulting in that I had to remake the upper bulkhead. The problem was that the hardener-tube on my epoxy-dispenser had clogged with crystalized hardener. 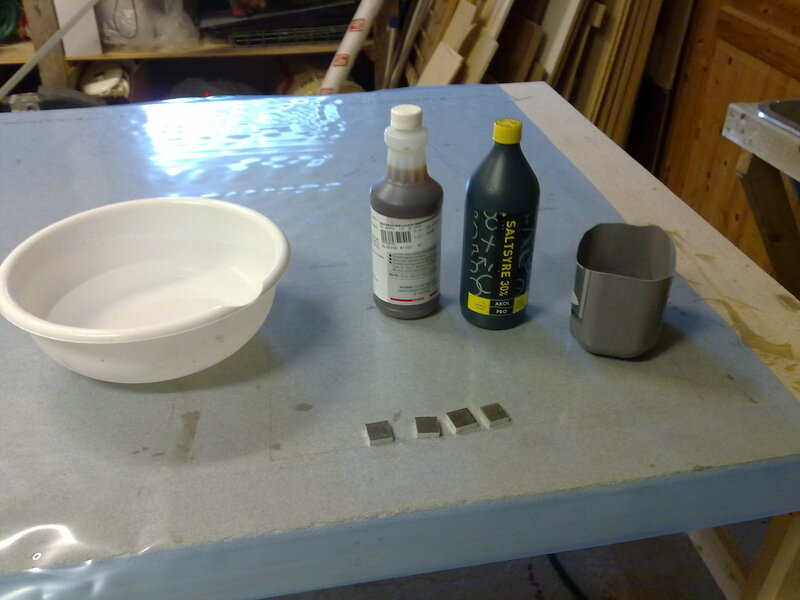 This resulted in less hardener in the epoxy and a part that did not cure properly. Lesson learned. The remake didn’t take much time or effort. 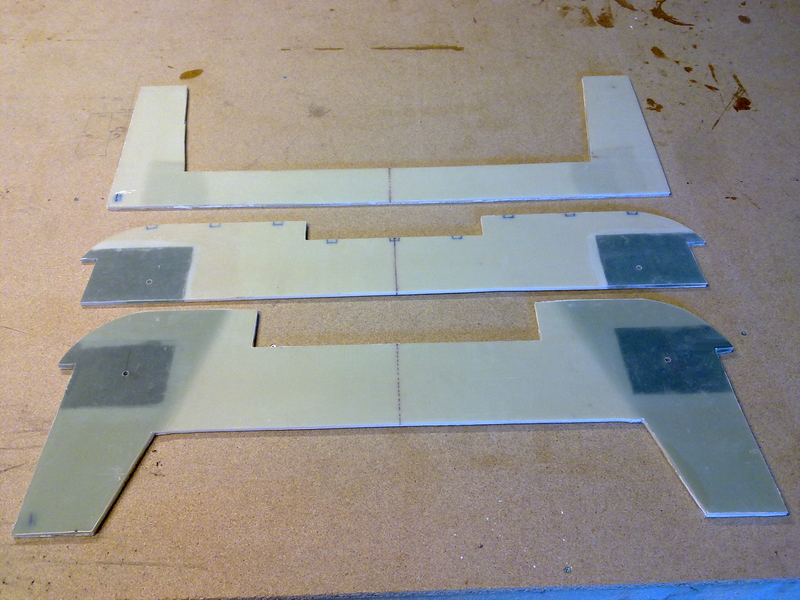 Making the hardpoints resulted in them beeing approx 1,5mm thicker then the foam. 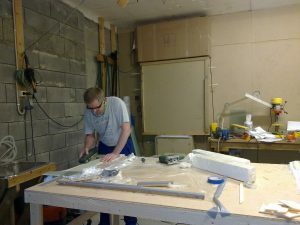 Using a belt-sander I reduced the 1,5mm of glass to a whole lot of dust. 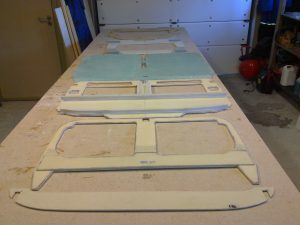 The firewall consists of two parts, a temporary firewall to be used as a template and a help when mounting the tub together later on, and the permanent firewall broken down in four pieces. 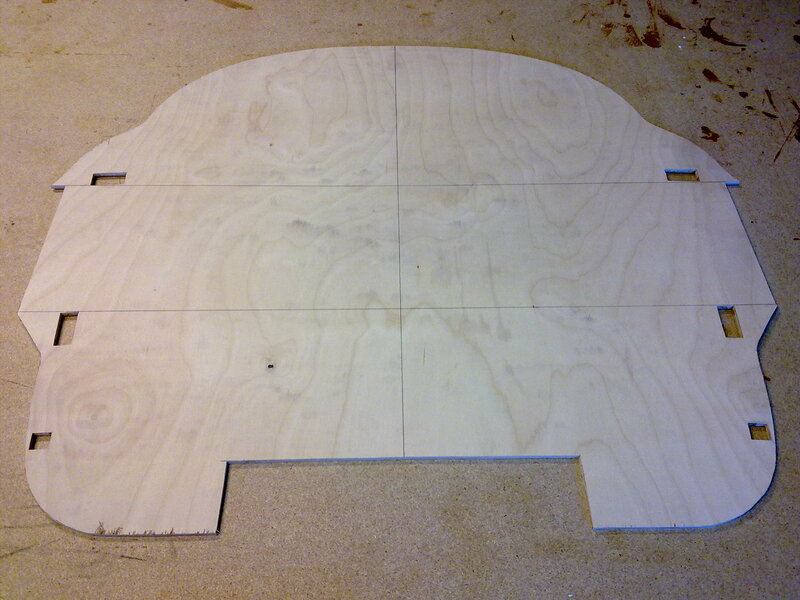 I traced the drawing onto a paper and cut out all the parts from 6mm birch-plywood. 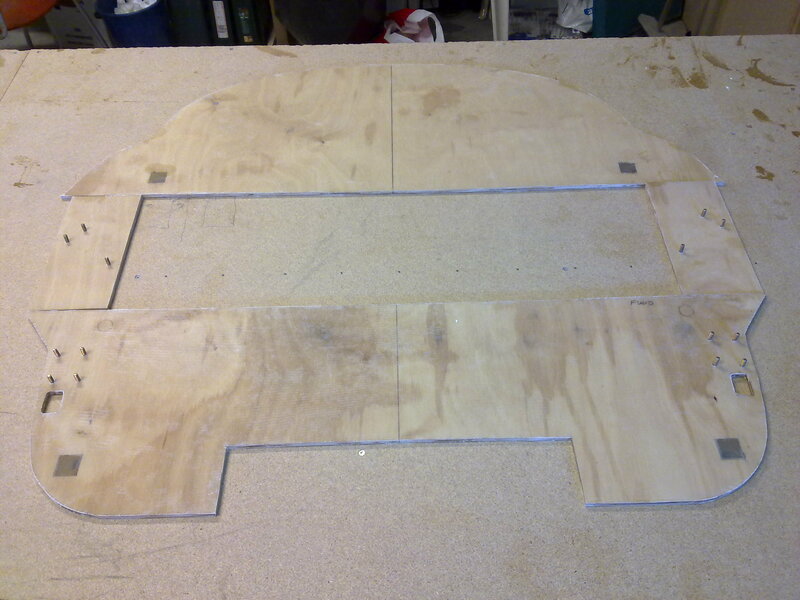 The temporary firewall is then left as it is, with some cut-outs for the longerons only. These will later be adjusted and transfered over to the permanent firewall. 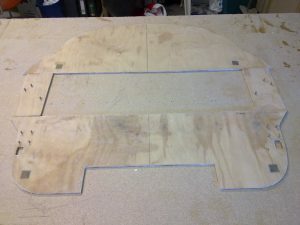 The permanent firewall consists of four separate parts made of plywood. They are to be glassed with one ply of bid on each side. In addition to this four aluminum-inserts are to be mounted as well as 14 screws. 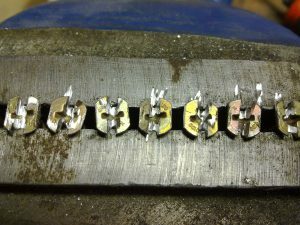 The aluminum-inserts have to be treated to prevent corrosion. The recommended way is by using a chemical called “Alodine”. The first step is to clean the parts. I was initially going to use a chemical called “Alumiprep” but is was not possible to get this in Norway. 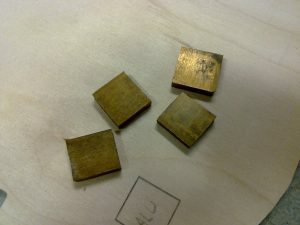 Shipping it from US was not possible either since it’s considered as haz-mat. After some research I was told that I could use Hydrochloric acid instead (Saltsyre in Norwegian), which I could buy in my local hardware-store. So the parts were treated with acid, rinsed in water, then treated with Alodine, then rinsed in water again and dried before they were mounted in the firewall. The hole was so tight that I didn’t have to flox or glue them in place at all. And here are the parts Alodined. They get a yellow/golden tint. 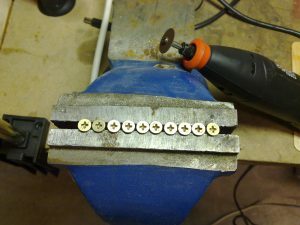 I started by fastening the screws in a vice. 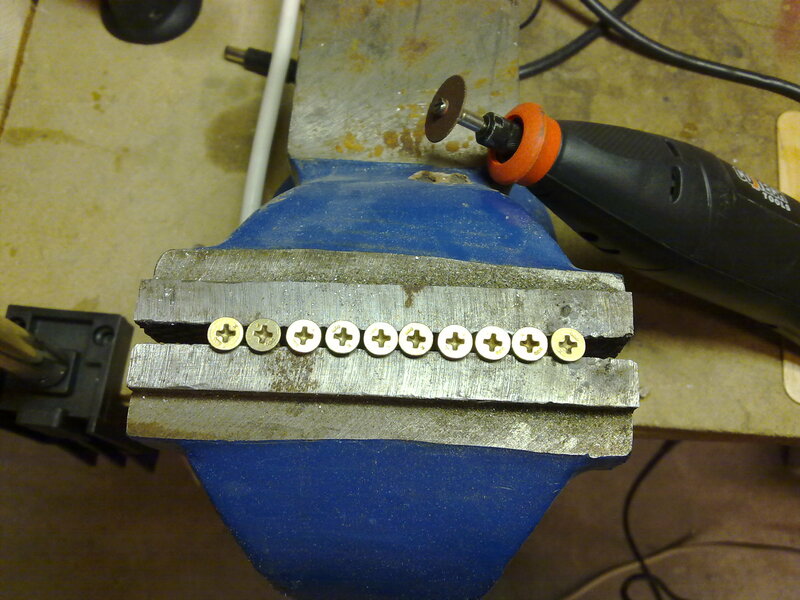 Then I cut a slot in the head to make room for the music-wire. I also grinded the head flat on both sides to make it even more stable. 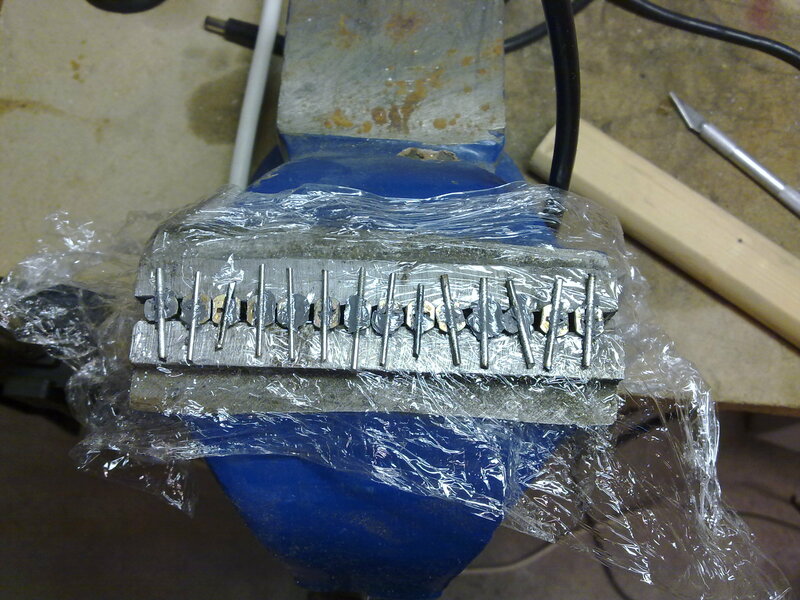 Here the music-wire is epoxied to the screws. 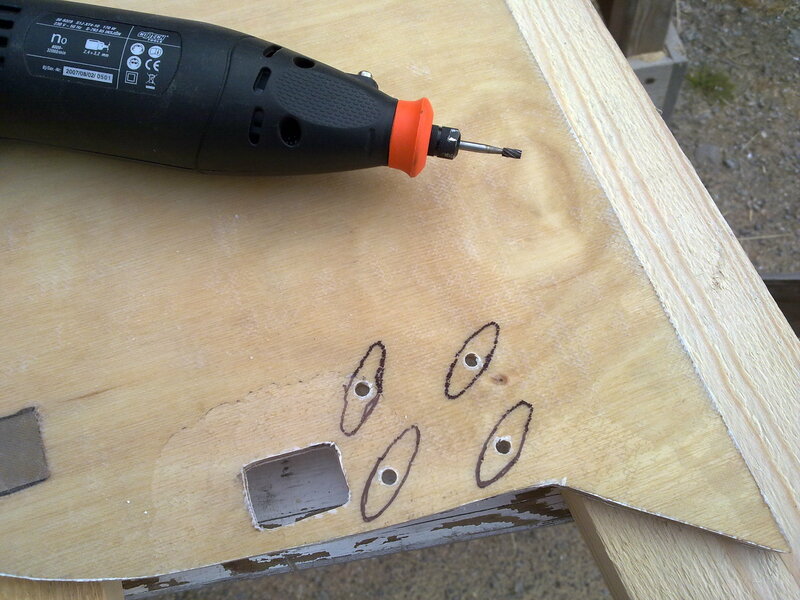 I then used the Dremel to route space for the screws. 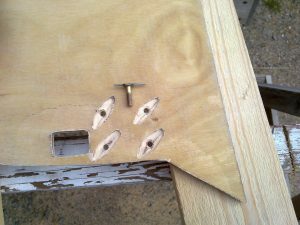 Here the screws are floxed in place and covered with BID. 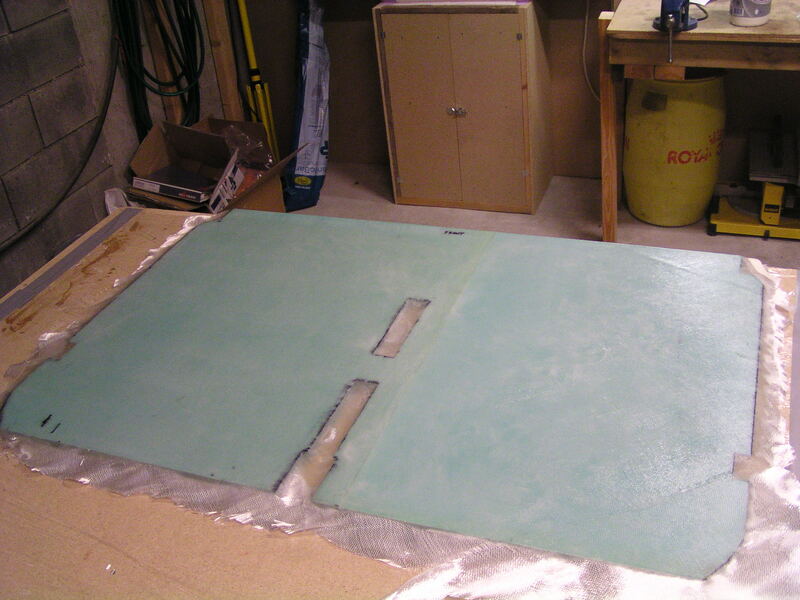 The permanent firewall finished so far. Here are all the parts lined up. When I use these tools I wear both ear- and eye-protection. The noise-level are not healthy, so a lightweight ear-plug is mandatory. 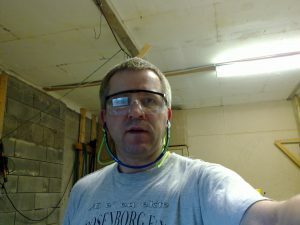 Also when cutting glass I won’t risk any needles in my eyes, glasses is therefore also mandatory for me!